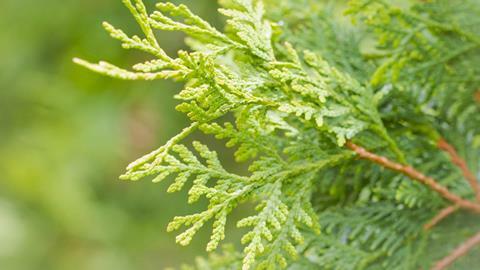 US scientists have derived several high performance fuel compounds from cedarwood oil. One has an energy density comparable to missile fuel, while another could replace diesel in an ordinary diesel engine. Challenging the perception that biofuels have inferior properties to their petroleum-based counterparts, these sustainable fuels could enhance the efficiency of land and air vehicles alike. First generation biofuels originate from starches, sugars, fats and oils with various biological sources, but they are not always suitable for use as a drop-in fuel and are usually modified to make them compatible with modern engines. Ben Harvey and Kale Harrison are chemists at the US Naval Air Warfare Center Weapons Division working on sustainable fuels. They hydrogenated cedarwood oil, containing high concentrations of sesquiterpenes, to generate hydrogenated cedarwood oil, which has an energy density 13% higher than JP-8 jet fuel. Hydrogenated cedarwood oil has a high ignition temperature making it only suitable for jet engines. 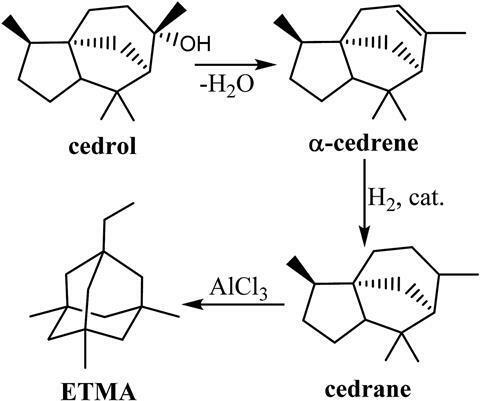 The team then isolated a compound called cedrol from cedarwood oil. They dehydrated, hydrogenated and isomerised it to obtain 1-ethyl-3,5,7-trimethyladamantane (ETMA), an alkyl diamondoid, so called because these small cage-like molecules resemble the repeating chemical structure of diamond. ‘Multicyclic hydrocarbons typically have very low cetane numbers, meaning that they do not combust as easily as straight chain hydrocarbons,’ explains Harvey. ‘The high cetane number of these fuels allows for their use in conventional diesel engines, while their higher energy densities can increase vehicle range.’ Indeed, ETMA has a suitable cetane number and viscosity for use in an ordinary diesel engine, with a 5% higher energy density than standard diesel.